The walkway to Baiting Hollow Free Library connects directly with Warner Drive: no parking lot, no parking spots. The 110-year-old library still requires patrons to complete sign-out sheets for books, instead of using its single public-access computer, and opens its doors just two days a week for six hours a day. BARBARAELLEN KOCH PHOTO | The 110-year-old Baitting Hollow Library holds 6,000 books. There’s no doubt you have to keep your eyes peeled if you’re looking for Baiting Hollow Library. Located on Sound Avenue, nestled between a residence and a side road, it appears to anyone passing by to be an extremely small house. But in reality, it’s an extremely small public library. 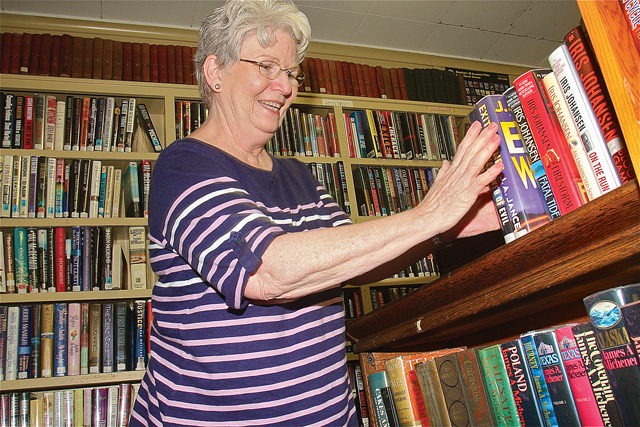 Though it does not boast the large number of books, services, programs or staff members you’ll find at most local libraries, it’s rich with character and history. The Baiting Hollow Library, painted light gray with burgundy shutters, consists of just one room. A narrow walkway leads from the door to the road and a sign on the front lawn gives the library’s name, along with its days and hours: Thursdays and Saturdays from 9 a.m. to 3 p.m. The library hasn’t always been in this location, however. In fact, it’s moved around quite a lot throughout its long history. Current librarian Charlotte Jacques is an expert on the subject. Full bookshelves line all four walls of the room, and Ms. Jacques usually sits in the middle, at a large table entirely covered with towering stacks of books. As she told the library’s story, she leaned back in her chair and smiled over an old scrapbook of aging photos and yellowing newspaper articles. According to Ms. Jacques, it all began in the year 1903. The club hosted a series of winter lectures that year and used the admission money to launch the Baiting Hollow Free Library, since there wasn’t a library in the community. The first location of the library was in the parsonage, where the minister of the church lives, and the first librarian was the wife of the Rev. Frank Voorhes. Eventually, the library outgrew that location and moved to a portion of the Baiting Hollow post office, now the Calverton post office, where it was run by two sisters who served as postmistresses. After the post office, the library moved to the home of Goldsmith Wells, Ms. Jacques’ great-grandfather, where it was operated by his daughter Sarah. After that, it returned to its original location at the rear of the Congregational church. Today, that space is occupied by two bathrooms. In 1941, the local Warner family donated a plot of land, so long as the spot remained a library. In a community effort, the Talmage family provided a house that was on their farm to serve as the library building. A foundation was poured and the house was moved from the farm to the designated site, where the library has been ever since. Ms. Jacques, who has been librarian there for the past 11 years, grew up with the family-run library. She started working there by filling in for her cousin on and off over the years, and eventually she took over. One such regular is Nathaniel Talmage Jr. Although he says the main reason he goes to Baiting Hollow Library is because of its convenience, he has an undeniable family connection. “It’s convenient for me and I can be in and out in two minutes,” Mr. Talmage said. “Also, I grew up with it. The library holds 6,000 books, which Ms. Jacques knows readily since she has to count them every January. Five visitors mark a busy day for the library and patrons sign a check-out card the “old-fashioned way,” since there aren’t any Baiting Hollow Library cards — or any computers. Most books on the library shelves are written by modern authors. Ms. Jacques picks out what she thinks people will be interested in reading from a catalogue or buys them at BJ’s. As for herself, the librarian loves mystery novels and has read all of Sue Grafton’s books. The library’s modest annual budget of about $11,000 covers Ms. Jacques’ salary, building maintenance and book purchases. She says she buys about 200 new titles each year. If you find yourself riding along Sound Avenue, don’t let the size of Baiting Hollow Library deter you from stopping in for a lesson in local history. Talk to Ms. Jacques to hear more of the interesting story of the 110-year-old library — or just let the book-lined walls speak for themselves. BARBARAELLEN KOCH FILE PHOTO | Runners navigate the muddy Survival Race course last year. Thousand of runners and “zombies” are expected to descend on the Dorothy P. Flint 4-H Camp in Baiting Hollow this coming weekend, May 4 and May 5. But while Saturday’s Survival Race and Sunday’s Zombie Race appear to have the support of Riverhead Town Board members, race organizers still don’t have a Town Board resolution approving the two-day event. Riverhead Supervisor Sean Walter said on Friday that town officials were still waiting on information from a town fire marshal. Mr. Walter said he anticipates the events will be approved by the Town Board, but that approval might not happen until Thursday’s work session, which is just three days before the first race. “This should have been submitted much earlier,” he said, indicating that the Town Board only first discussed the proposals two weeks ago, and the applications were only filed on March 1. Both events are being organized by Dean Del Prete, who also owns Cousins Paintball centers in Medford and Riverhead, and race director James Villepigue. The two organized a one-day Survivor Race at 4H last September, which attracted more than 4,000 runners and spectators. This year, they plan to hold a May 4 Survival Race, the May 5 Zombie Race, and a second Survival Race on Sept. 7 — all at the 4H camp off Sound Avenue, according to Mr. Villepique. The Survival Race is a 5K run in which participants will tackle a number of obstacles and mud puddles. The Zombie Race is a 5K run in which participants must allude people dressed as zombies who will try to capture flags worn at the runners’ waists, said Mr. Villepique. Racers have a belt with four flags, like in flag football, and if the zombies capture all four flags, that runner is out of the race and turns into a zombie. “The difference between the two is that the Survival Race is more of an athletic type event while the Zombie Race is more of an entertainment event,” Mr. Villepique said. The zombies are given costumes and are screened, he said. The zombies cannot touch runners and are instructed not to scare people to the point they are actually frightened, especially children, he added. When the group appeared at the April 11 Town Board work session, board members initially said an event of this size should have been proposed much earlier, and Mr. Walter suggested it might need a mass gathering permit from the county, and that it had already been submitted too late for that. But race organizers said they would keep the attendance below the 5,000 attendance figure for which a mass gathering permit would be required. Riverhead Police Lieutenant Richard Boden also said that last year’s event did not cause traffic problems. A main complaint last year was that the Survival Race used Terry Farm Road, which is a private road. The race organizers say they will not use that road this year. While the Survival Race may have about 4,000 runners, the runners start in waves of about 100 each half hour, so there is never a point where all 4,000 runners are entering or leaving the site at the same time, Mr. Villepique said. GIANNA VOLPE FILE PHOTO | LiV owner Richard Stabile with casks of the company’s new single malt whiskey. Long Island Vodka, the island’s first and only distillery, was recently awarded a double gold medal in a blind American-made vodka tasting contest hosted by thefiftybest.com, ranking them fourth out of 20 contenders. The domestic vodkas were served blindly to 19 judges, who scored the vodkas on a one to five scoring scale with five being the best. Long Island Vodka came in fourth, with another New York vodka, Peace, claiming the first-place spot. Peace is made from locally grown wheat in Bethel, New York and pure Catskill mountain water.